The nation’s largest teachers union plans to reduce its budget by $50 million in anticipation of an unfavorable verdict in Janus v. AFSCME, a case heard by the U.S. Supreme Court in February that challenges the right of government unions to charge non-members for representing them. When delegates to the National Education Association meet in Minneapolis in July, union leaders will introduce a two-year budget that cuts expenditures by $50 million, an estimated 13 percent reduction from this year. 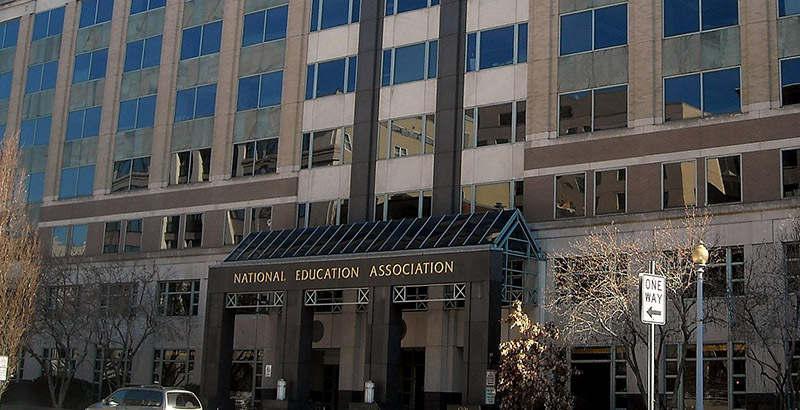 NEA’s budget committee forecasts a two-year loss of 307,000 members if, as expected later in the spring, the Supreme Court eliminates agency fees — mandatory costs to workers who don’t become union members but are covered by union agreements. Those near-term losses will almost entirely occur in the 22 states where fees are still charged, erasing post-recession membership gains in places like California, New Jersey, and New York. As of the end of April, NEA’s total membership stood at 3,018,492 active education employees and retirees. Almost all of its affiliates with significant membership growth in the past year were states with agency fees. Though the proposed budget cuts will not take effect until September, NEA has already begun to reduce staff, eliminating 41 staff positions through buyouts, early retirements, and attrition. NEA employs more than 500 people at its Washington, D.C., headquarters; the average salary is $123,613 plus benefits. Affiliates in agency-fee states appear to be following suit. The Massachusetts Teachers Association recently approved a budget that projects a 10 percent membership loss in the 2018–19 school year, for example. What good would this do, besides being a minor source of revenue? Simple. So, as NEA members were leaving the union by the hundreds of thousands, you and I and all of our friends could theoretically take their place. Wouldn’t that be fun?